Last week I directed ‘Blackadder Goes Forth’ for Scunthorpe Little Theatre Club – hence why I’ve been awol again. Everything was going swimmingly until two weeks from show week we discovered that we didn’t have First World War period evening dresses for ‘Bob’ and Lieutenant George in the ‘Major Star’ episode. Nothing in the Club stock and nothing available at the place we were hiring the uniforms from. It was too late to buy the dresses available on eBay as they were in China and so the only option was to make them. That job ended up on my plate. I can sew. I can use a sewing machine and I made the tree costumes several years ago for one of our pantos, but that was under supervision from my mum, who is an experienced dressmaker. This was going to be flying solo with a deadline and with the memory of my one and only other excursion into making clothes hanging over my head. My first needlework project at middle school was to make a blouse so my mum equipped me with a paper blouse pattern and some horrible yellow polyester. In the first lesson it obviously didn’t occur to my needlework teacher to tell a class of eleven-year olds that when you have a paper pattern from which you can make different versions of a garment, you only need the pieces for the style you plan to make. I did as I was told: I opened the packet, cut out all the tracing paper pieces, pinned them onto the fabric and cut every one out. I was then promptly held up to ridicule in front of the whole class. I never did finish it and that was the end of my sewing for a long while. So I bought a pattern, hunted through the Club’s fabric stock for something that would be suitable for evening dresses and ten days before show week, I made a start on the first frock. It was…interesting. And challenging. And thank goodness a) I’m not working at the moment because I ended up pulling some seriously long days and b) I was able to ring my mum and get her advice when I couldn’t make head or tail of the instructions or the pictures. It was not the straightforward pattern I had hoped for as a complete novice. My 90 year old Frister and Rossmann coped superbly with taffeta, lace, satin and organza. Multiple layers? No problem? Different fabrics? Easy. I love that machine sooooo much! There was a lot of hand stitching and finishing as well – the Friday before our Sunday Get-In I stitched for thirteen hours with breaks for cooking and eating meals, but I am pretty pleased with the results. Firstly, Bob’s dress. There wasn’t enough of the floral print for a whole dress but the taffeta matched the turquoise flowers perfectly and she was literally on stage in it for less than three minutes. George’s dress had to be made for a very tall and skinny bloke, which was another interesting challenge, but thanks to the purple lace I found in a box while looking for something else, I think this one worked a treat. My middle one loves it and had to be dissuaded from taking it back to university with her! I’m proud of the back. Well out of my comfort zone, but I think I may have finally laid the ghost of that bloody awful yellow blouse. And the show was a triumph too. 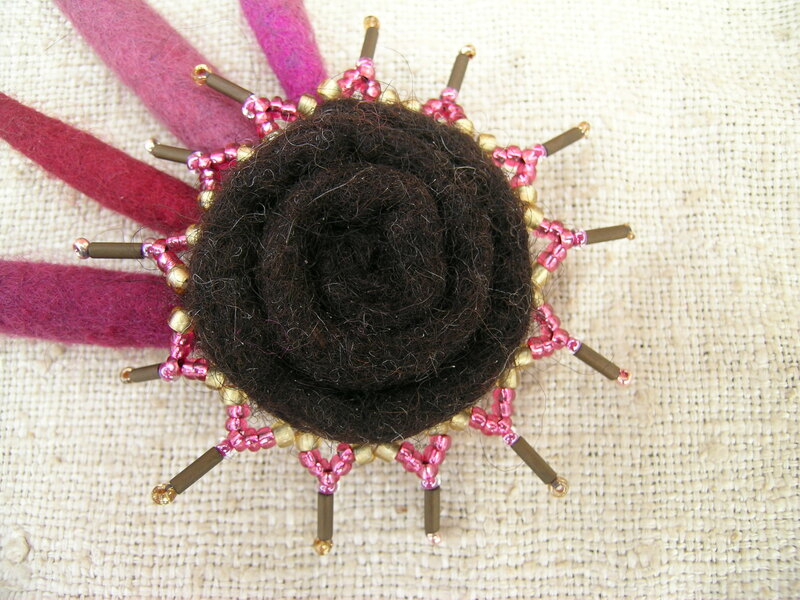 …and the Brazilian embroidery rose I’d made up into a card but not sent because I couldn’t bear to part with it! 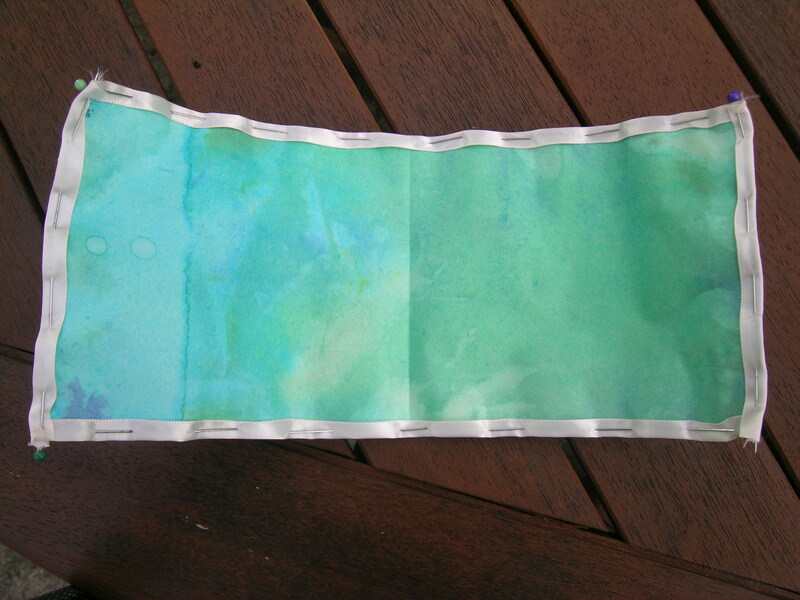 …into a simple seascape and a piece of the paper stitching we did with Alice Fox recently which I mounted as a card. …was the first to be finished by stitching him onto a piece of indigo dyed fabric with rows of running stitch that merged into the kantha and then mounting over a 7 x 5 inch canvas. 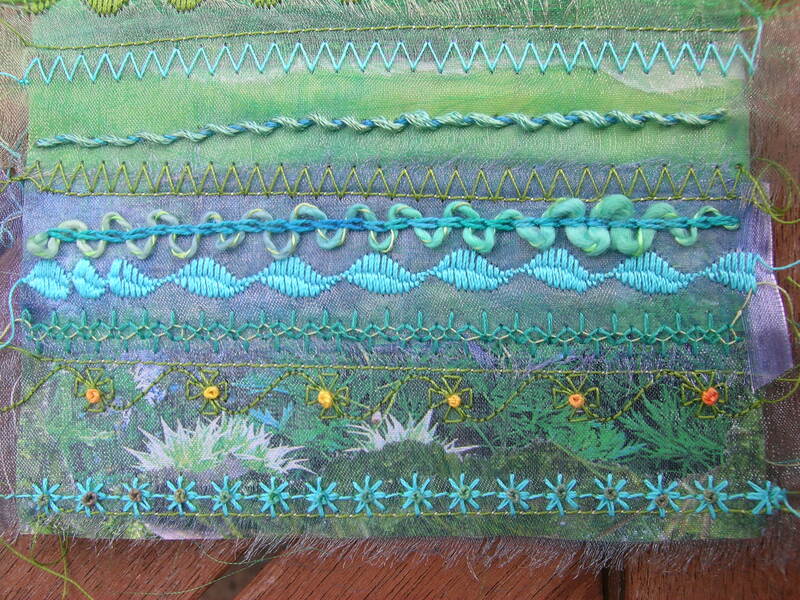 I also finished a selection of little stitched fragments for my Alice Fox book. But the really big finish was my English paper piecing. I get bored easily with the piecing process and when we did the workshop, I chose small equilateral triangles – probably not the best shape in the circumstances! At the end of the day I had a pile of triangles in shades of browns and indigo and absolutely no idea what to do with them. Seeing the workshop on the list I wondered if it was even possible to finish the project, but I had what promised to be a lengthy committee meeting that week and repeatedly stitching together triangles looked like the perfect way of passing the time. It was: by the end of the meeting I had all the finished triangles stitched together and an idea very firmly in my head. Without using half triangles the shapes you can make with equilateral triangles are rather limited, so I created a diamond which I planned to stitch onto this gorgeous piece of hand dyed indigo with some quilt wadding in between and a plain piece of indigo dyed cotton for the backing. 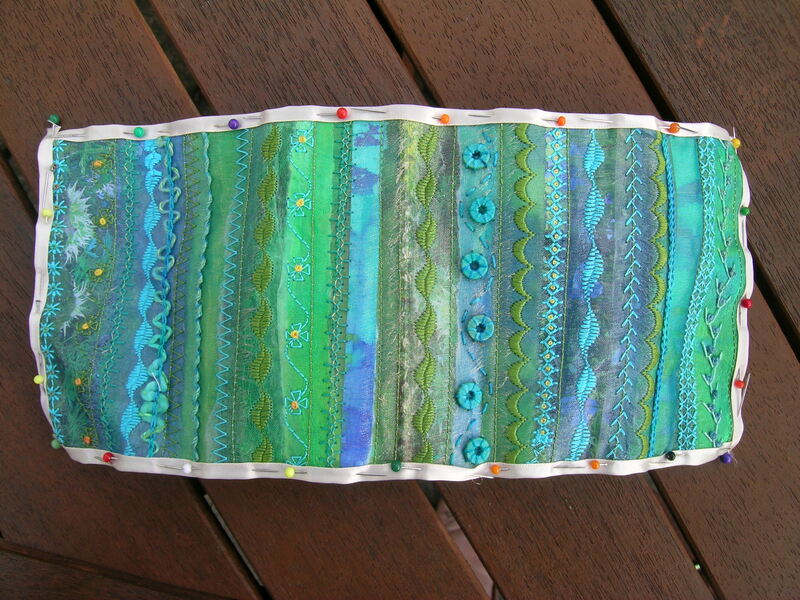 My trusty Frister and Rossmann coped easily with quilting through all the various layers along the lines of the triangles. Then I joined a number of strips of woodland themed fabric in three different brown colourways to get enough and had a go at a tutorial I found online (where else?!) for adding a binding with mitred corners as you go. It worked!! …added a hanging sleeve and couched some glittery thread around the edge of the diamond to hide the line where I had machined it down. In hindsight and with more time I would have appliqued it invisibly to the top. …in about three days. I still can’t believe it! My Travelling Book page was quick, easy and finished a full day before the Guild meeting, which is virtually unheard of! My Frister and Rossmann rose to the occasion yet again, stitching happily through a sandwich of cotton calico and crinkle rayon with cotton in the bobbin and golden coloured rayon in the top to define the edges of the fish. Seeing how well it coped with the rayon, I thought I’d try metallic Gutermann thread to just highlight the inside of the fins and the main body. Metallic thread? Piece of cake. Silver sequins and pale blue beads for the eyes and they were finished! I know they are gold but they made me think of the herrings – the ‘silver darlings’ – which were such an important part of the economy of East Anglia and in the lives of my dad’s side of the family, who were trawlermen. And then it was a short step to the words of a folk song I grew up with: Windy Old Weather. So on Saturday off the silver darlings went on the next round of the Travelling Book project! I’ve never been a quilter for several reasons – use of a sewing machine, length of the project, lack of small fiddly hand embroidery etc. 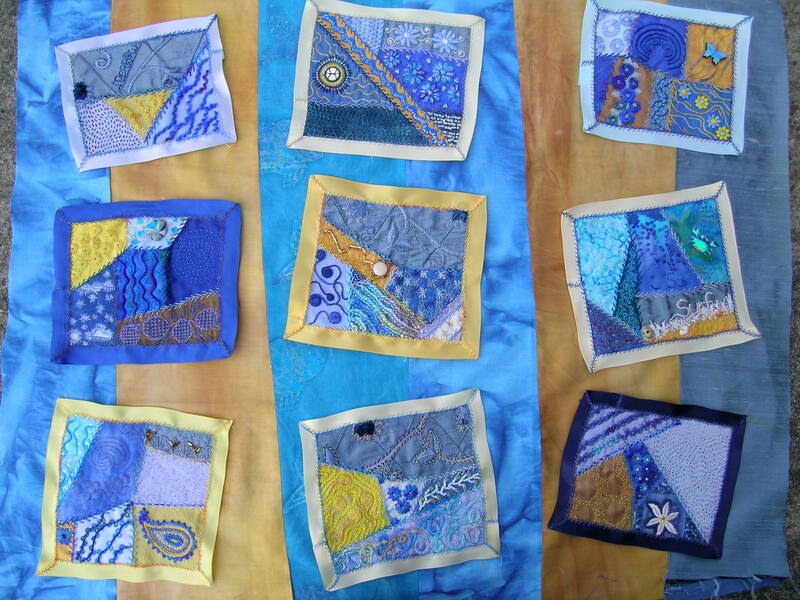 But I do love looking at other people’s quilts and I adore beautiful fabric. It was while visiting my son in London two years ago that I discovered an amazing quilting shop in East Molesley, just across the road from Hampton Court Palace, and I fell in love with a little charm pack of oriental themed squares in black, white and grey with touches of red. I experimented using them for a few potential layouts but they finally disappeared into the cupboard, appearing occasionally to be admired. That is until I came back from holiday at the end of August and decided that I was going to make them into a lap quilt for my middle one who is going away very shortly to Bangor University to study Archaeology. My 90yr old Frister and Rossman was pressed into service and using black silk dupion for the alternating squares, I began to piece my first ever quilt top. And then I sewed them into a rectangle for the quilt top. I was determined to use fabric I already had for the backing and the binding, which for the back meant that I had to insert a strip of kimono fabric scraps into the black silk skirt gore I was using to make it large enough. 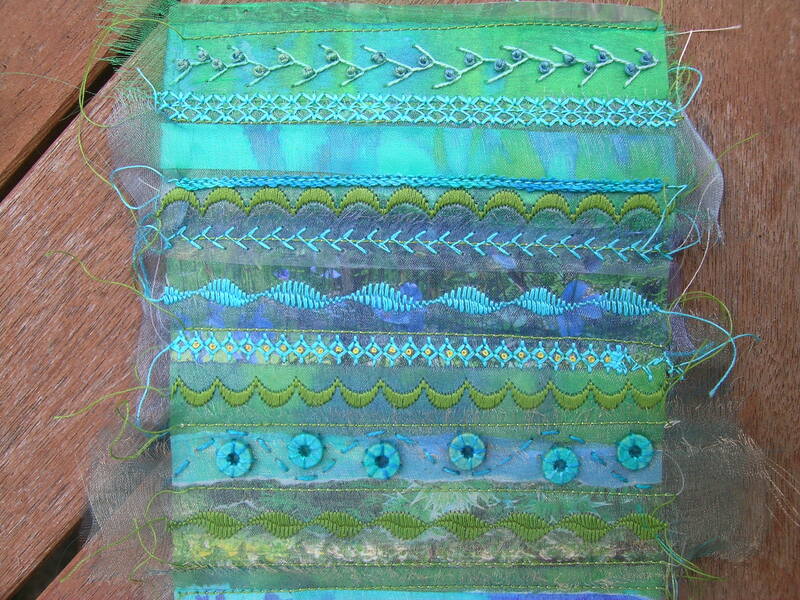 Then I sandwiched the front, back and the batting together and the Frister and Rossman rose happily to the occasion, stitching through thick layers of cotton, batting and silk to quilt the top. I went for a very simple option – just following the line of the fabric pieces to create a grid effect on the back. Next was binding the quilt and as this is something I’ve never done before I went to YouTube and thanks to a very clear tutorial managed to add some cotton kimono fabric for the binding. The Frister and Rossman whirred gently and made short work of four layers of cotton/silk and the batting. I love that machine so much! 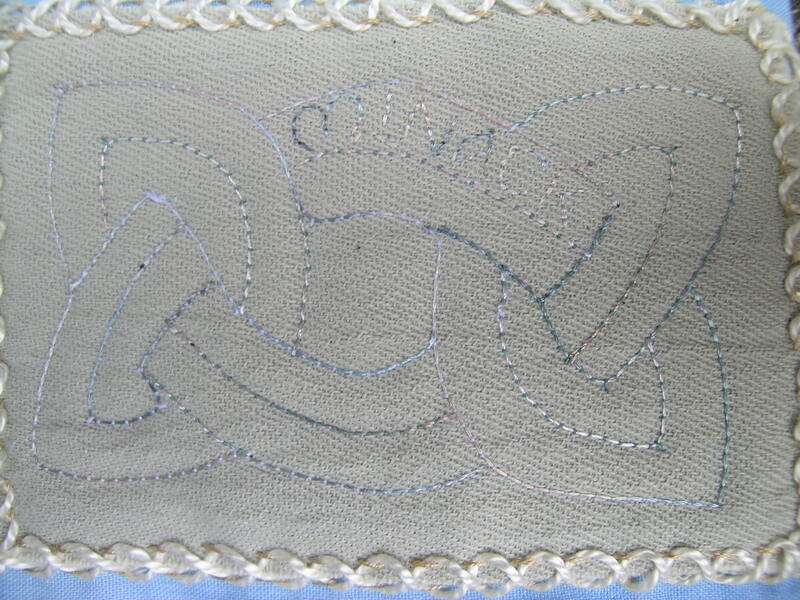 …and something neat but not a mitre on the back when I hand stitched the binding to the reverse. So pleased with the lovely neat finish. Finally a label embroidered in floss silk to add to the back. 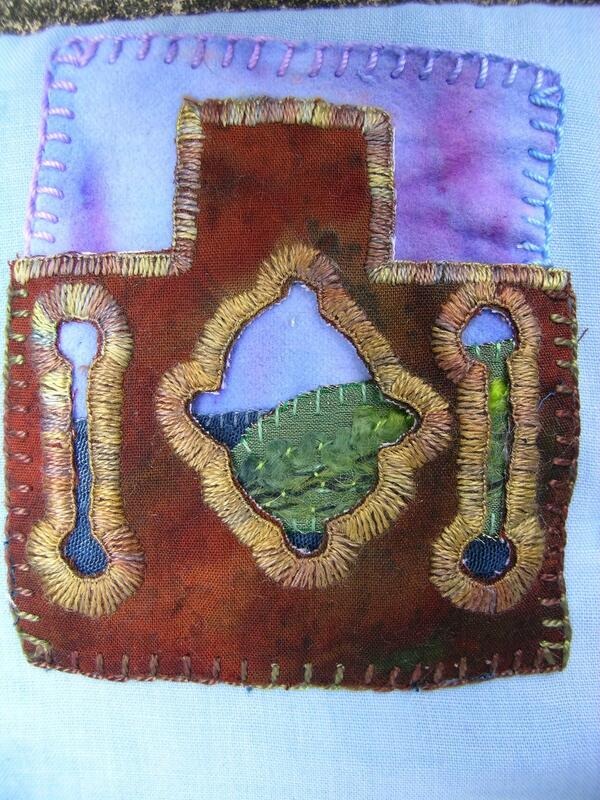 Unfortunately I forgot to photograph it once I’d appliqued it onto the back though! And the time taken for this project? Five days. Now to be fair, apart from cooking, washing and shopping I didn’t do much else for five days but it’s been lovely to see this project work up so quickly and turn out so well. I have a feeling it won’t be my last quilt. I’ve been carrying on with my goal of sorting and rationalising all my ‘stuff’ this year and after a useful amount of space gained by getting rid of books and magazines that I won’t read again, I was onto the corner of the lounge where I tend to store my in progress work. There was an awful lot still in progress, so I decided to get finishing. 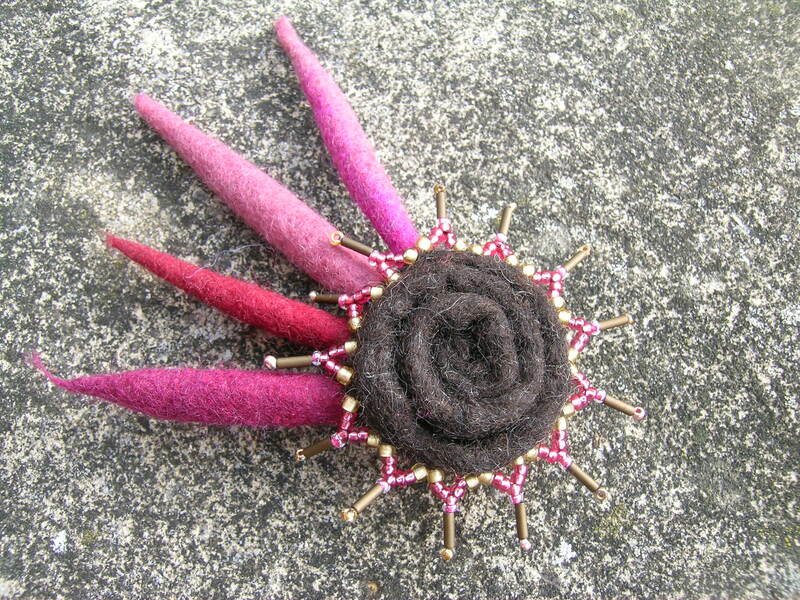 First, a new brooch. 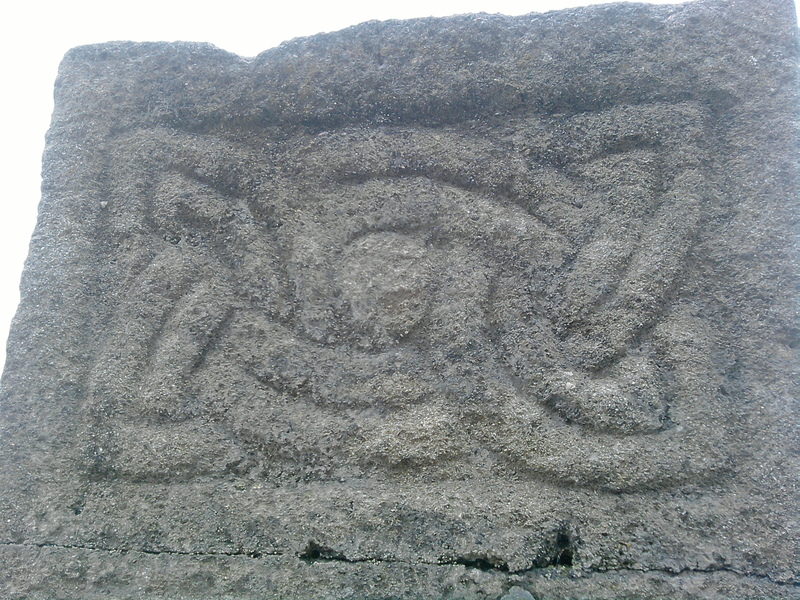 The brown coiled middle was made as a working example for a workshop session I taught at our Embroiderers’ Guild in the spring and the short fat dreadlocks I made at school at least two years ago. Combined, I liked the effect, so I stitched the dreads onto the back of the spiral and then found some gold, raspberry pink and milk chocolate coloured beads for the edging. The back is simply finished with a circle of felt with the brooch back stitched to it and then blanket stitched onto the reverse of the spiral, hiding all the construction stitches. I’ve also moved on with my journal cover. 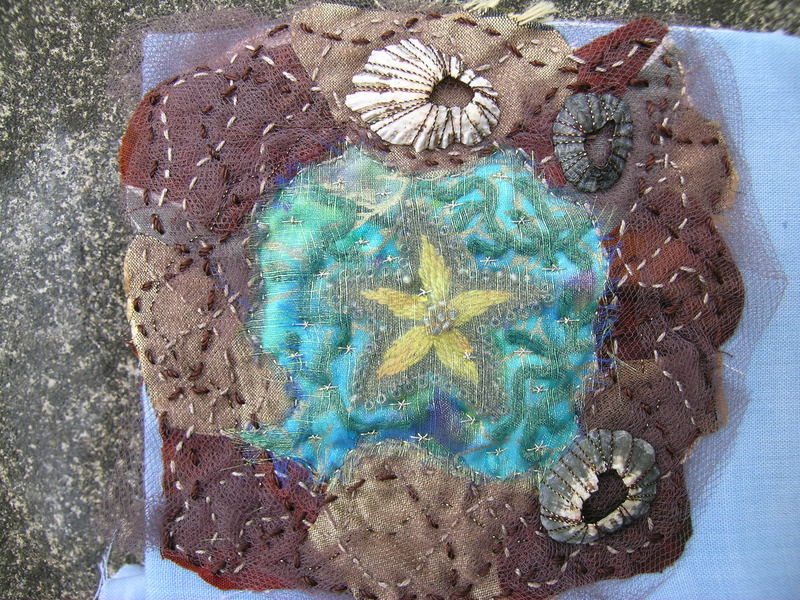 First I finished off the hand stitching. French knots (I decided against beads) in the centre of some of the machine patterns, the chain stitch completed and threaded with slubby thread and the threaded running stitch re stitched with smaller stitches and whipped with stranded variegated silk. On the front, more french knots, both on machine and hand stitched elements and pekinese stitch along a line of machine straight stitching. Then I stuck the end papers to the reverse of the cover. 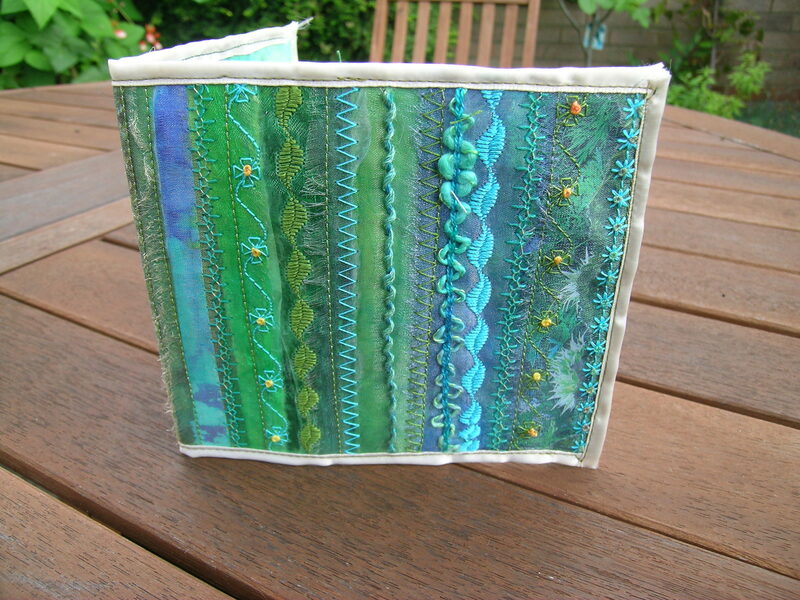 As this is going to be my holiday journal this year it’s going to be in and out of bags and well handled so I was a bit concerned about how well the edges would stand up to that sort of treatment. I decided to use some satin ribbon to bind them. I know the cream is a contrast but to tie in with the organza layers I intend to layer it over with silk organza ribbon. 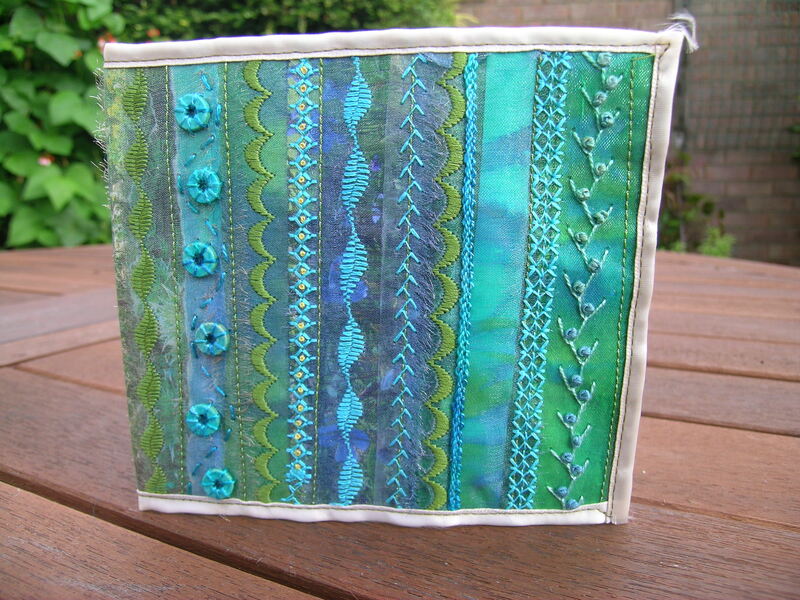 Probably hand stitched down – there is only so far I can stay out of my comfort zone! We had actually already visited Pendennis earlier in the holiday but there was a Knights’ Academy event on and my girls were desperate for some knightly training! 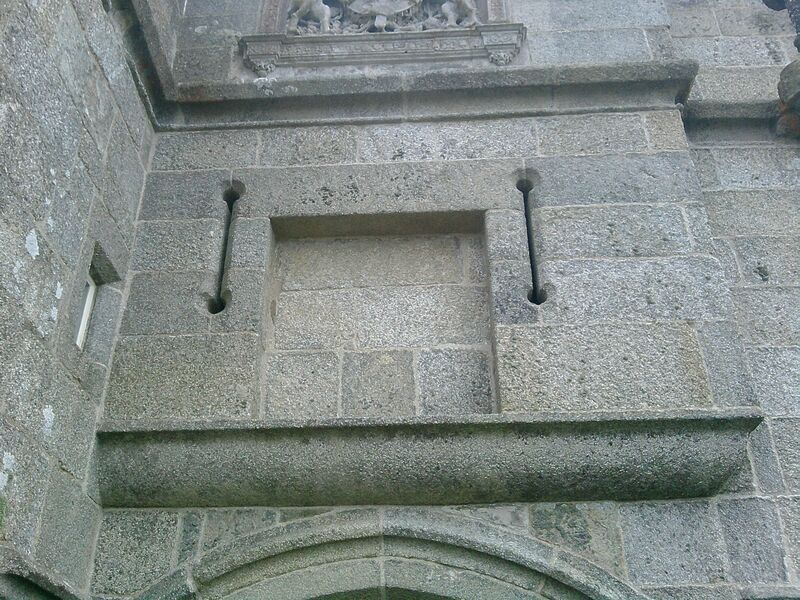 Wandering round the keep again I was struck by the shapes of the windows. …to create an imaginary view through the windows and out onto the Fal Estuary beyond. You might recognise the very useful hand dyed cotton flannel (the last piece left, which is why the sky is wonky) for the sky and the dark blue crinkled dress fabric from Day 2 for the sea. I fell completely in love with this place. 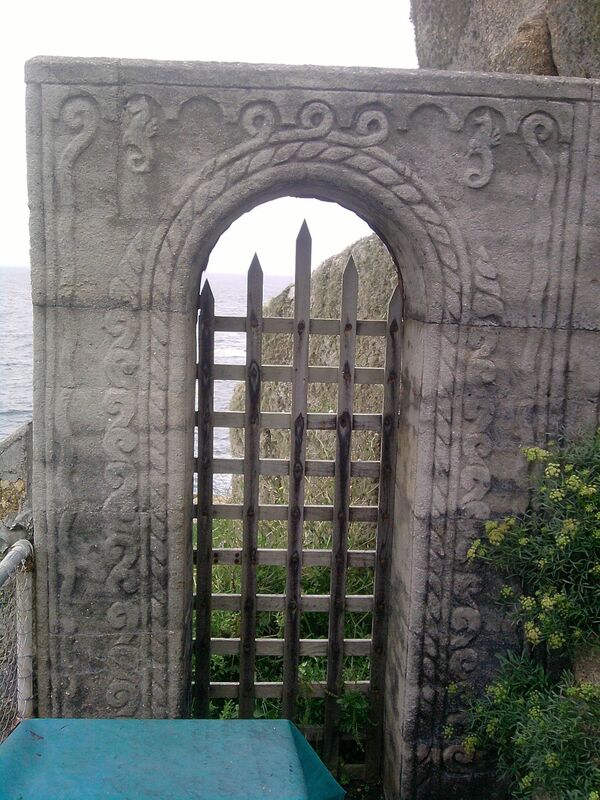 It’s location; the story of Rowena Cade who almost singlehandedly built it; everything. 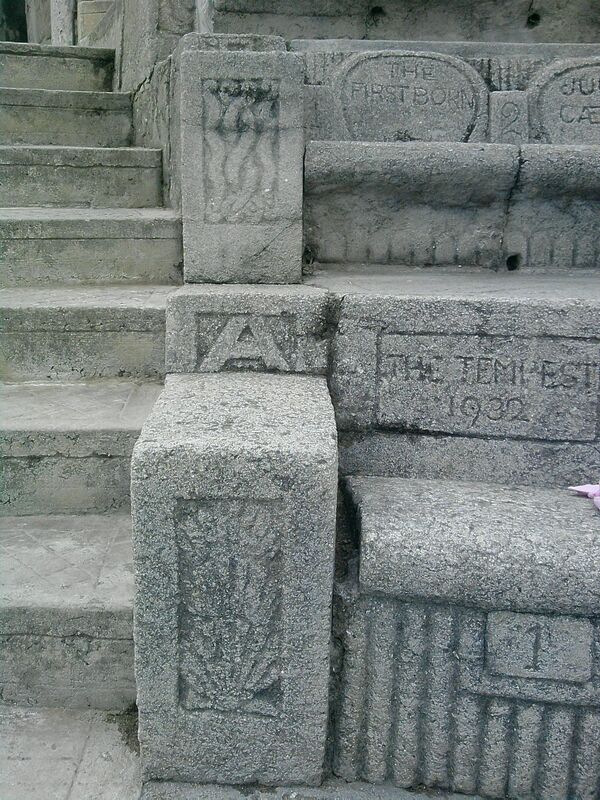 And I loved the patterns impressed into the concrete. I knew I wanted to do something quilted with them. Trapunto possibly, but looking at my dwindling stock of fabric I didn’t have anything that was remotely suitable for the stone-like background. So I made notes in my sketchbook and deferred this one until I got home. Day 14: Coverack, on the Lizard. We love beachcombing on this beach, looking for pieces of Serpentine. I actually prefer holed limpet shells to intact ones and was very pleased to find a piece of pinky red sari ribbon too! So it had to be a rock pool, incorporating the holed limpet shells and some brown net ribbon I bought at a little craft shop in Mullion earlier that day. The starfish in the centre was another experimental printed and embossed motif like the moon I used for the compass rose. I filled it with long and short stitch in yellow silk and edged it with gold beads. 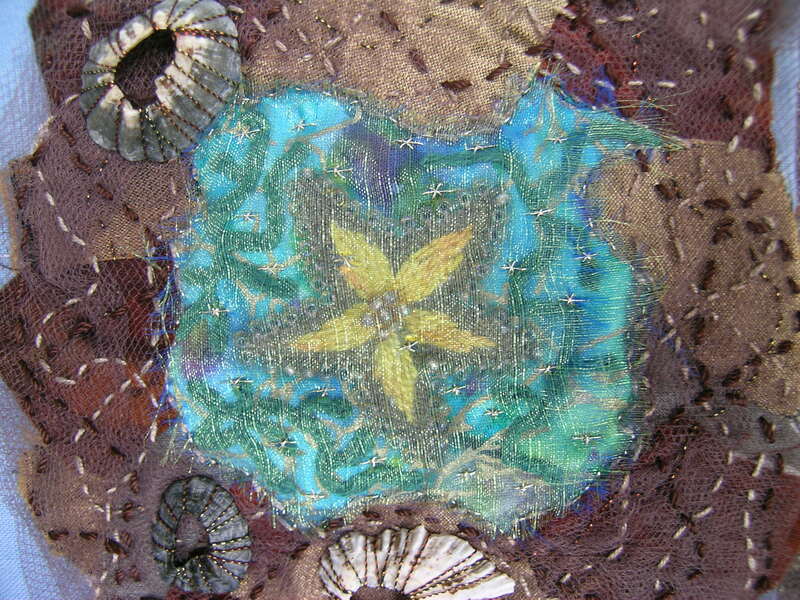 It was sewn down onto a scrap of turquoise and gold patterned print and chain stitch seaweed added. 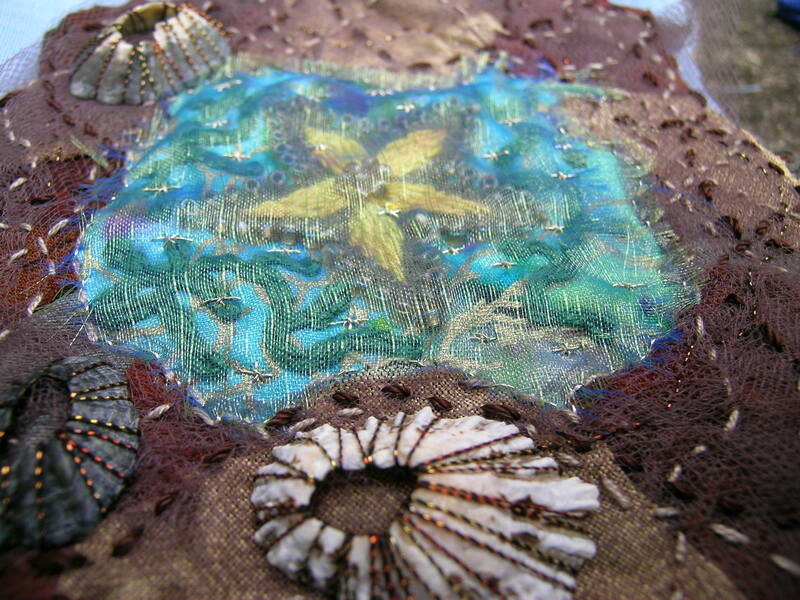 Then I cut all my remaining brown and gold pieces into rock shapes and pinned them round the edge of the rock pool before covering the whole lot in scrunched up net ribbon and using running stitch in a variety of toning threads to stitch them to the calico backing. 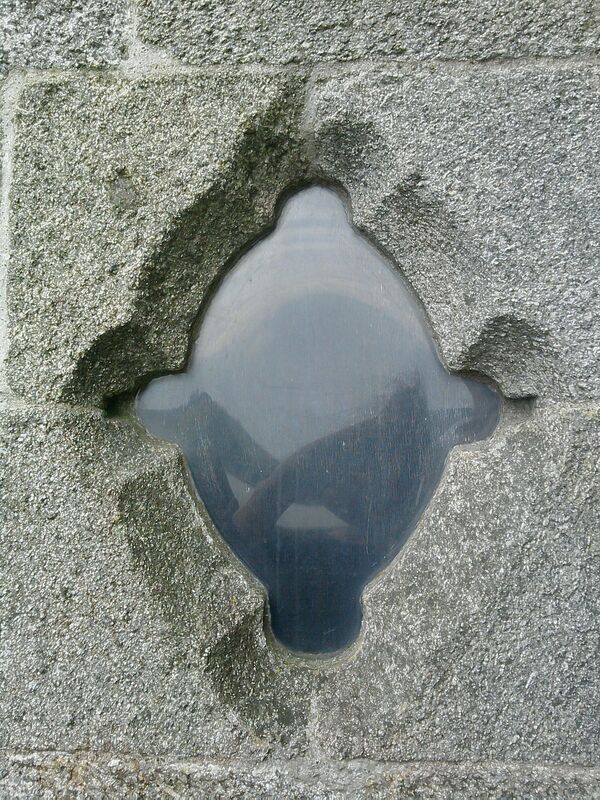 Holed limpet shells were stitched down with Maderia variegated metallic thread. Over the pool I laid a piece of shot blue and gold organza and stitched it down at the edges so I could cut away the excess. 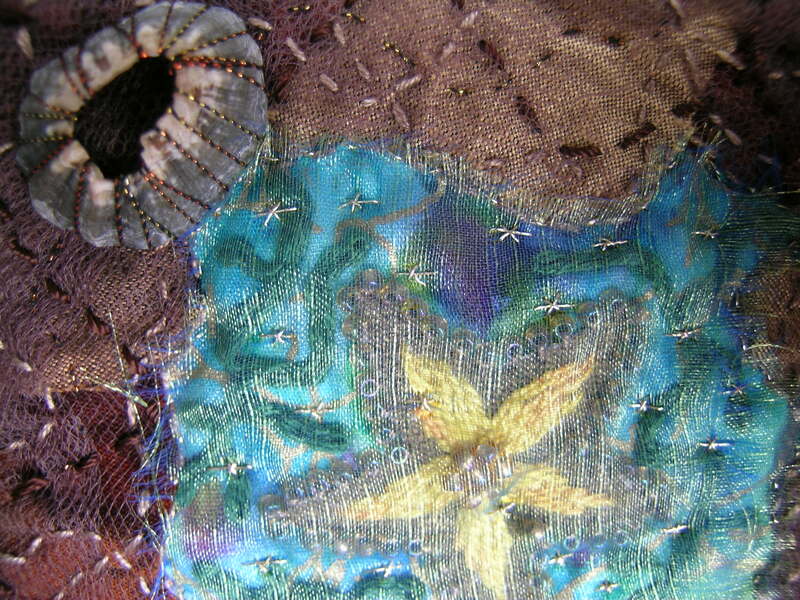 Finally I used fine gold thread to seed the surface with little ermine stitches to look like glints of sunlight. Having picked out a selection of blue fabrics for the backing I laid them out on some blue muslin to see how they looked together. An all blue background was just too much but I remembered I had some lovely hand-dyed yellow heavy weight cotton from when I was sorting out the ribbon roses kits. 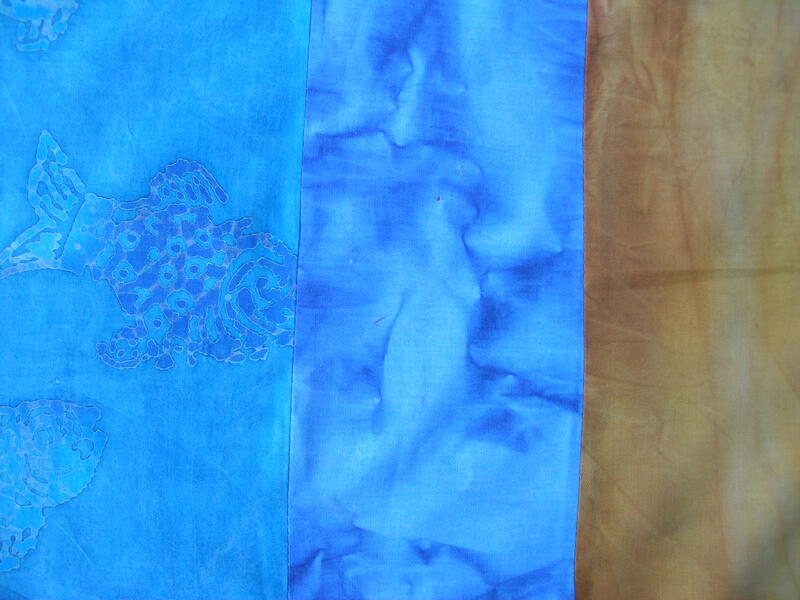 From left to right – lovely patterned cotton (not sure if it’s a commercial print or a hand dye but the colours and shapes are perfect), hand-dyed heavy weight cotton, commercial cotton batik print, more blue cotton, more yellow hand-dye and a piece of silk dupion. The newly serviced Frister and Rossmann was pressed into service to sew them together and using it was a pleasure. The colours, on my monitor certainly, aren’t true. 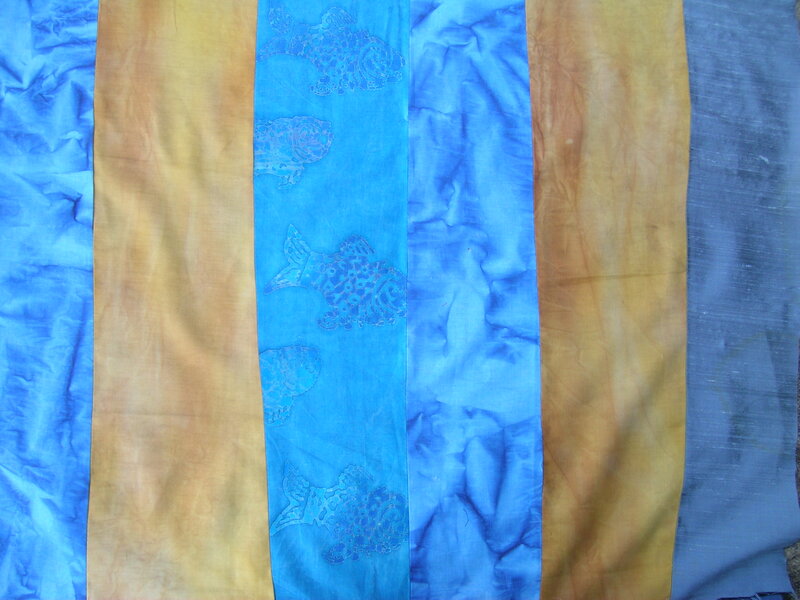 The batik is actually turquoise and the swirly patterned blue much more of a true sky/sea blue. But I love the colour combination. Then it was time to scatter the blocks onto the background to have some first thoughts about where they might go. I quite like this arrangement but may do a bit of tweaking when I come to pin them down. One thing that really struck me when I was viewing the thumbnails was how much the blocks look like postcards, which in a way they are; holiday snapshots but with the memories woven into the stitches. 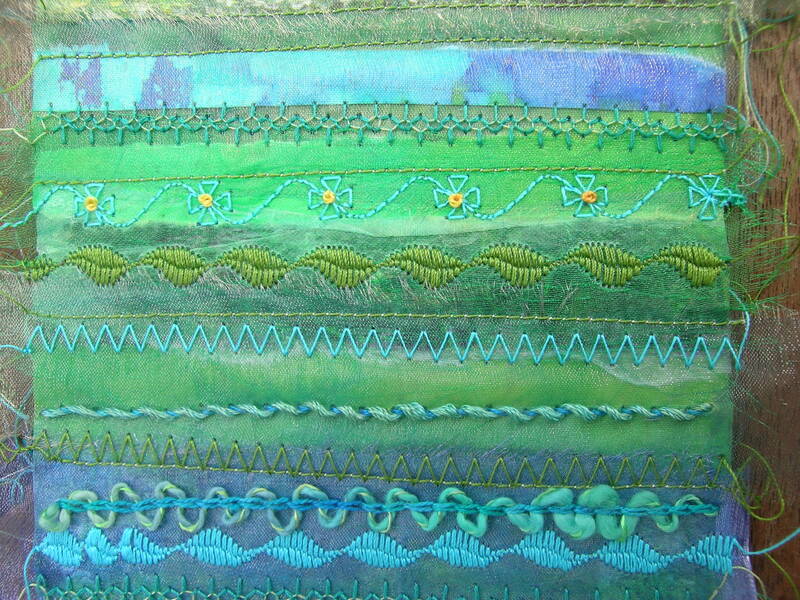 The next thing I have to decide is whether to stitch the blocks down as invisibly as possible or to make a feature of the stitching by feather stitch them down like the ribbon borders are feather stitched onto the blocks.